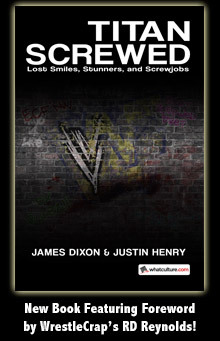 The Greatest Night In The History Of Our Sport - Issue #1: Day Of The Dead - WrestleCrap - The Very Worst of Pro Wrestling! And that event is tonight! Tonight, in the debut event for Wrestlecrap Fantasy Wrestling Federation, we present an epic tag team war! A pair of brothers from the south, known for riding motorcycles, being tough as nails, and having as much dysfunction as an American Presidential campaign, will square off against … well, much the same thing, really. Only taller. Let’s meet the wrestlers! Introducing first … hailing from what was once the northern Georgia area of the United States before the collapse of society as we know it, Daryl and Merle Dixon! You can smell him through your monitor, can’t you? So much smoulder, you’re probably ovulating right now, regardless of gender. Merle and Daryl grew up in a textbook redneck house; single alcoholic parent, abuse, neglect, dirt, squalor, poor English, PBR for their 11th birthday, truck stop prostitutes for their 12th … you know the deal. As they grew up, Merle ran afoul of the law and did some time in the stony lonesome, while Daryl, defying the stereotype, learned a useful trait: hunting and tracking. When they reconnected following Merle’s release, they redoubled their efforts to better themselves and enrolled in a local community college … no, just kidding, they became drifters and meth dealers, with Merle dominating the relationship and routinely belittling his younger brother. Oddly, this charming existence gave them the tools to be perfectly suited for when a zombie virus broke out and obliterated humankind. They separated for a while due to a long chain of circumstances involving Merle being a jerk (big shocker, I know), and when they reconnected again, they found themselves on opposite sides of a turf war. By then, Daryl had matured and become a much stronger man who didn’t defer to his older brother out of habit. What this will do to their partnership tonight is anyone’s guess. Both men are more than capable brawlers and highly adaptable to their surroundings. Neither get to bathe regularly, so their powerful stench could probably knock out a bear. Merle once sawed off his own hand and survived. So, you know, he’s pretty tough. Also, probably damned crazy. Daryl can track a white moth in a Yukon snowstorm. If it’s alive, he can track it. There is no hiding from him. They just as often brawl with each other as they do with others, making them slightly worse partners than nitro glycerin and a paint shaker. Both men love to drink, so their sobriety at any given point in time is in question. Merle once sawed off his own hand and survived. So, you know, he has one hand. 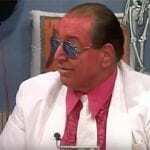 And he replaced that hand with a steel capped prosthesis that has a bayonet welded to it, which, in most wrestling promotions (and probably most municipalities in general), is illegal. Daryl’s tracking ability is about as useful in a wrestling ring as a bowl of ice cream in a baseball game. This is wrestling, not hide-and-seek. And now their opponents … hailing from … uh, whatever fits their individual gimmicks best at the time … Kane and The Undertaker! Everyone wanted to tell ‘Taker he didn’t need to wear his coat for the Kinect to work with his X-Box, but you just don’t argue with him. Seriously? You want me to untangle that Gordian knot? No way. I don’t have all day. This site doesn’t have the bandwidth for a column of that magnitude, and I don’t know that I could live that long to write it anyway. Mathew Sforcina attempted it a few years back at 411mania, first for Undertaker, then Kane, and each one took, like, eleventy billion parts. 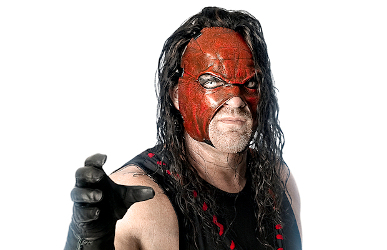 Here’s the one for Kane, and here’s the one for Undertaker. If those are on the tl;dr side for you, and yet you still don’t know who these people are, I’m not sure I can help you. Or why you’re on a wrestling website in the first place. Go Wikipedia them or something. Sheesh. I can’t do everything. Both men are excellent fighters. Some of wrestling’s finest. Both have lengthy careers and have faced and defeated virtually every icon you can think of. Undertaker has rudimentary MMA skills, can grapple surprisingly well, and a crazy threshold for pain. Kane is psychotic, and possibly controls fire. They fight with each other as often as other people. Perhaps more. Both have lengthy careers, and show the wear and tear of it with every passing day. 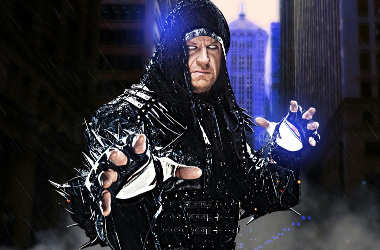 Undertaker is 51, has delusions of MMA proficiency, and is so slow, cornfields have grown from seeds to harvest in the time it takes him to walk the aisle. One side are a pair of survivors in a zombie apocalypse. The other think they’re the harbinger of Death and a Hell-sent demon, respectively. I mean, come on. It’s right there. With two pairs of hard-drinkin’, bike-ridin’, fist-throwin’ good ol’ boys like the Dixons and the … other pair of brothers who don’t have a simple, unified surname … a simple tag match won’t do. These are men who have no need for rules. No need for boundaries. No, sir, there’s a better way for these boys. Let these boys fight and roam (and possibly find into the bar in the venue) with the freedom they need. And now, ladies and gentlemen … we know our participants. We know the rules. There’s nothing left to do but get down to business! It’s time! Sensing perhaps that both the size difference and the less-than-standard-issue number of hands would become a factor rather quickly, the Dixon boys get the jump on Undertaker and Kane backstage, with Daryl swinging a steel chair and Merle using a Singapore cane. The Dixons wail on their opponents, driving them stumbling and bumbling through the back hallways of the arena. It appears, at first, as if the Dixons will just be able to bludgeon their way to a victory. But the pain tolerance levels of the Brothers Of Destruction is as supernatural as their gimmicks. After winding up in the locker room, Undertaker and Kane turn the tide by simply ripping the weapons out of the hands of their attackers. Without the equalizers in hand, the Dixons are no match, pound for pound, with Undertaker and Kane. The Dixons are taken to the woodshed, as they’re tossed all over the locker room like a plastic bag in the wind. The only reason Merle and Daryl can put any distance between them and the maniacal BoD comes down to luck; Merle is able to clock Kane with his steel prosthesis. Undertaker leaves Daryl to go chase after Merle through the hallways, which Daryl does as well. 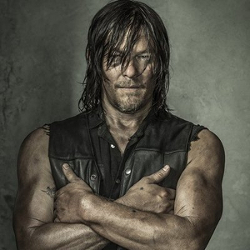 They all wind up at the loading docks, where Daryl and Merle are able to double-team Undertaker and get him down to the concrete … only as soon as they do, Daryl confronts Merle on leaving him behind. Merle, cocky and condescending, doesn’t see what the big deal is; Daryl, on the other hand, is tired of Merle’s crap, and bum-rushes him, driving him into a garage door. The two start to scrap on the ground, with Daryl having the upper hand … until the garage door opens, then is brought back down on them by Kane. With Daryl down, Kane drags Merle into the cold night air of the loading dock. The noise of the crowd, kept out by a large chain link fence, can be heard as Kane takes his time torturing Merle, making him bleed and making him beg for mercy. 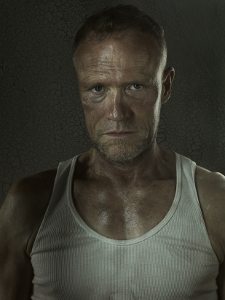 Kane, of course, shows none when Merle asks, and continues to punish until Undertaker joins him. Which is when Kane turns on Undertaker, choke-slamming him out of the blue. Kane, unhinged as always, yells at Undertaker about being the true monster of the family and how he doesn’t need anyone’s help to beat up the Dixons. Except he doesn’t expect Daryl to have used the shadows to stalk him. When Daryl springs out, a chain wrapped around his hand, Kane never sees it coming. Daryl clocks him, then gets a couple more punches on the ground for good measure. Merle, ever the abusive jerk, tries to make the cover, but Daryl pulls him off, and once again, the brothers Dixon are at each others’ throat as the crowd rages on, banging on the fencing. With the Dixons otherwise occupied by their own civil war, they never notice the BoD coming to … except they too wind up throwing down with each other instead of their contracted opponents. The crowd is at a fever pitch now, the fence actually swaying back and forth as the match grinds to a halt because of the two sudden implosions of partnership. When the fence comes crashing down, only then are their intra-family fights interrupted … because it isn’t a bloodthirsty audience at all, but a bloodthirsty horde of the living dead. Armed with literally nothing whatsoever, the foursome can’t fight off hundreds of flesh-eating zombies, especially when they’re surrounded on all sides. The foursome are torn limb from limb as the living dead devour their flesh, bringing the match (and humanity) to a sudden and disappointed conclusion. Result: No contest due to interference from a zombie horde. 10 Responses to "The Greatest Night In The History Of Our Sport – Issue #1: Day Of The Dead"
Well, that was different, but the good kind of different. That was the intention. 🙂 Glad you liked it! This is EXACTLY what I was hoping it would be … great work! Glad it met expectations. Believe it or not, I worked on this as hard as, if not harder, than an RTB … mainly because comedy writing is REALLY hard. Email me at jed316@msn.com. I have the full size. Tis very big. 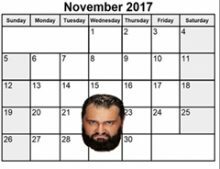 Do I have to remind you about the last Zombie we saw in wrestling…? This reminds me of the Wrestlecrap Survivor Series from a few years back. I actually was part of one for a while, way, way back in the day. Pre-kids, so at least 11 years ago. Sadly, with all of life’s responsibilities as a father and husband, two columns, and being an avid gamer … only so many hours in a day, ya know? I was taught a good formula, though. If you’re interested, email me at jed316@msn.com.